June 27, 2011 Dan O. Not as amazing as everybody says it is, but still awesome. In 1950s Los Angeles, three wildly different cops (Guy Pearce, Russell Crowe and Kevin Spacey) form an uneasy alliance to ferret out deep-seated police corruption. But some people will do anything to land their faces in the pages of trashy Hollywood tabloids such as Hush-Hush magazine. This is one of those films that almost every film geek has as one of their all-time favorites. I wouldn’t really put it in mine but I will say I had a great time. The best thing about this film is it’s overall feel is just very cool and slick. The story is your typical detective story that you would see in any neo-noir film, but there are little twists and turns that really keep you involved with it. But this is also a great “whodunit” as well because you have to pay attention real well to the story as it moves along because all the little clues, double-crosses, and twists come when you least expect it too. The whole time you’re constantly wondering just what’s going to happen next, and the script really adds to that suspense level well. Curtis Hanson does a great job here as director because he takes this pretty enjoyable script, and makes it even better on-screen. This is a great detective story, but also a very fun one because it just looks beautiful, with the 1950’s look and the action is great too. You have a lot of great shoot-outs here, to add to the mystery appeal of this film, and the pace is very taut and gives enough detail to the story so we’re not totally lost. However, my only problem with this film is that something just didn’t fully glue me in like I was expecting it too. Something was just not there and I don’t know if it was the script that kind of left me hanging, or the direction that was just a little too taut for me, I don’t know what it was but I just couldn’t get fully involved with this story, even though I liked the angle on police corruption. Not much really has changed in the past 50 years, and that is a real damn shame. The ensemble cast is what really had me going with this film. The best thing about this cast is that they do so well with characters that are so fully fleshed out, that they could have had about dozens of spin-offs of each and every one of these cool characters. Kevin Spacey is great as Jack Vincennes and plays that cool, but slick cop so well. 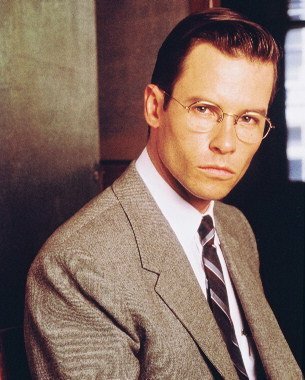 Guy Pearce is very good as Ed Exley because he starts out as this smiley-faced, bright-eyed rookie who just wants to do the right thing and make sure justice is served. However, he starts to get a little more vicious as he soon starts to realize all the corruption within the force, and he does a believable transition too. This was probably the first introduction of Russell Crowe to the world, and with good reason because he’s awesome as brutish, brawling and self-righteous police “Bud” White. Crowe is great at playing those big and bad characters who have a lot more to them then meet’s the eyes. Kim Basinger won an Oscar for her role as Lynn Bracke, which is OK, but she didn’t do an amazing job here, just pretty good. Danny DeVito is perfect as the slimy and snarky gossip magazine writer Sid Hudgeons, James Cromwell is ever so evil and corrupt as Dudley Smith, and David Strathairn is only in a couple scenes as Pierce Patchett but does a good job as well. Consensus: Though there was something that just didn’t compel me as much, L.A. Confidential is still a well-directed, perfectly scripted, and fun detective story, that keeps you guessing with it’s smart story and will just entertain any popcorn-friendly watcher. I own the film, just need to give it a watch. Yeah that’s how it was with me. Had it for the longest time, but didn’t even know. Check it out Sam, you’ll like it! Thanks! This was Guy Pearce/Ed’s movie. He makes it so that the audience doesn’t know whether he’s stay benevolent after the film’s events. He really does make this film easy to watch because everything basically happens with him in it. It’s just a solid film, and very entertaining. I love mysteries and noirs, so when I finally saw this it was awesome. It’s a little long, maybe, but still awesome. It is very entertaining and I had a good time but something just felt like it was missing for me to care more about these characters. But still glad you liked it a lot! i loooooove this movie. I think Kim Basinger was good but not great. that would be the only criticsm i would give it. Basinger is good but not as amazing as everybody made her out to be. Glad you looooooooooooooooooove this one Candice! I also love this movie, one of my favorite of all time. The characters are well developed and up until the midway point, you don’t even know who is a good guy and who is a bad guy. It also a wonderful retro atmosphere that make it seem like it was made in the 60’s or 70’s. It does have that very cool feel and I kept wondering just who was the good and bad guys, but for some reason this just wasn’t as amazing as I was expecting really.